Young Jamar, lives with his family on the Atlantic coast. When news channels report a hurricane approaching, everyone in his neighborhood prepares for the impending storm. Most folks in the area have experienced hurricanes before, so they aren’t overly concerned, but they do all they can to minimize the storm’s impact on their family and neighbors. Later as the wind begins to howl, they play musical instruments and share memories of past hurricanes, as they wait for the winds to calm. Hurricane: Jamar’s Story, is an enlightening children’s picture book that shows how people can and do come together in times of need. Jamar’s family exhibits a calm resolve as they set about preparing for the worst in hopes that their efforts will be unwarranted. The underlying story of a tightly knit family with cherished traditions, gathering together in love, and bound together with a sense of purpose makes this book a true cultural treasure. 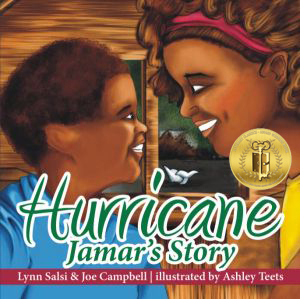 Recommended for home and school libraries, Hurricane: Jamar’s Story, has earned the Literary Classics Seal of Approval.